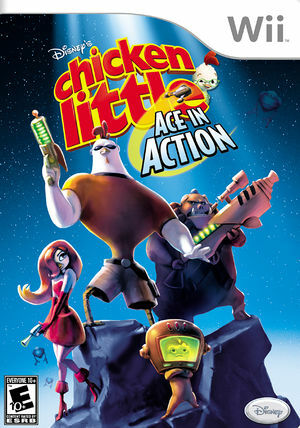 Inspired by the "superhero movie within the movie" finale of Walt Disney Pictures' film "Chicken Little," Chicken Little: Ace in Action features Ace, the superhero alter ego of Chicken Little, and the Hollywood versions of his misfit band of friends: Runt, Abby and Fish-Out-of-Water. The crew of the intergalactic Battle Barn faces off against Foxy Loxy and her evil Amazonian sidekick, Goosey Loosey, who have an evil plan to take over Earth. Battle evil alien robots through multiple levels across the solar system and combat your foes in one of three distinct game play modes: Ace on foot as a soldier, Runt as the driver of an armored tank, or Abby as the pilot of a spaceship. The original Chicken Little and his friends Abby, Runt and Fish we know from the film are featured in cut scenes throughout the game. Prior to Hybrid XFB in 5.0-5874 to get any graphical output, XFB Real must be enabled. Post 5.0-5874 "Store XFB to Texture Only" must be disabled to avoid purple borders during videos. The graph below charts the compatibility with Chicken Little: Ace in Action since Dolphin's 2.0 release, listing revisions only where a compatibility change occurred. This page was last edited on 10 December 2017, at 04:34.